Millions of people in the U.S. watch billions of videos every day. This may be why eMarketer expects U.S. digital video ad spend to rise by 41.4 percent this year and by nearly 40 percent next year as well, when outlays will reach $5.7 billion. Measuring video, however, can seem like a shot in the dark. Video intelligence company BrandAds today announced general availability of BrandAds Bridge, a video ad analytics solution that allows media buyers to see how their in-stream campaigns are performing across different media vendors and devices in one real-time dashboard. With CPM-based pricing, BrandAds Bridge is a way to measure the impact of any-sized video ad campaign, from a massive media blitz to a small test campaign. 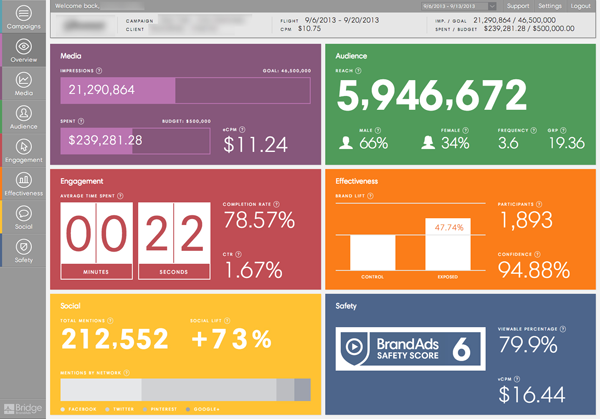 BrandAds’ dashboard tracks more than 30 video ad metrics across multiple vendors, campaigns and devices. BrandAds Bridge includes baseline metrics such as reach, frequency, gross rating point (GRP), viewability and time spent, but also includes real impact metrics such as brand lift by demographic segment, social lift, social sentiment and BrandAds’ own brand safety score. The goal is that by using BrandAds, advertisers can quickly assess how well different creative and vendors are performing so they can make informed changes on the fly. Here is a screenshot of the BrandAds Bridge video ad analytics solution.